SOUTH PASADENA, CA — Rumors are swirling that Landmark Theatres will close the venerable Rialto Theatre in the near future, no date given. As reported at Metro Blogging L.A.
UPDATE 8/10: It looks like it’s official. The Rialto will close on August 20th. The future of the building is still up in the air but it doesn’t look like it’s going to be torn down. Read more in the Pasadena Star News and the Los Angeles Times. I live in New York, but just looking at the picture of this beautiful marquee makes me mad to think that it’s forced to close down because it’s not taking in enough money to stay afloat! Do people honestly prefer the chaos and the insanity of the multiplex experience over a gem like this??? There’s so much peeling paint on the exterior and the gorgeous blade marquee is all burned out. It’s a real eyesore. Hopefully it’ll get some much needed TLC and remain intact. On vacation, I searched for historic movie palaces in the LA area and enjoyed the Rialto! Its beautiful interior shouldn’t be gutted. It appears in the book “The Last Remaining Seats” for good reason. It has 1920s Golden Age Hollywood glamour! South Pasadena can follow the example of the restored Warner in San Pedro http://www.warnergrand.org/ and restore the Rialto for live entertainment, cultural performances, AND a film series. I sincerely hope South Pasadena treats this theater better than Pasadena proper has. I knew the end was near when the theater began running first run studio films instead of the little independent gems. There is no question that this building needs a lot of work. I only hope it doesn’t meet the same fate as the Raymond, State and others did up the road. The single screens continue to disappear in favor of the big obnoxious AMCplexes. Sad that it has come to this and I am sorry to see the Rialto go. It appears with the arrival of the Landmark 12, Lnadmarks theatres is trying to become one of the big players in motion picture exhibition. “I only hope it doesn’t meet the same fate as the Raymond, State and others did up the road.” Exactly. This is really sad news, hopefully it does not become a ghost of what it once was like the Cove Theatre in La Jolla, CA, also operated by Landmark until it closed in 2003. It was Awesome inside, now it has been multiplexed…. The moviegoing experience at the Rialto has progressively worsened over the years. Aside from the peeling paint, the seats are decrepit and the sound system woefully inadequate. I resolved not to return after a visit about a year ago. The only way to win back patrons is to significantly refurbish the place. … For a model of a well-managed, large older movie house, consider The Fremont in San Luis Obispo. 3 generations of my family enjoyed “The Simpsons” movie there last month. I haven’t been so delighted since I was a kid in the ‘50s. I don’t blame Landmark Theaters, for thier decision to close the Rialto Theater. They are in the business to make money. Landmark propsed a remodel some time ago, I asume as a point to starting a discussion. The multiplexing was the last proposal I heard. It may have not have been as bad as people think. Many people have only seen multi-plexing done on the cheap. Expamles are the Highland 3, The Academy, and the old Eastland theater. But anyone whos been to the Egyptian Theater in Hollywood knows what a proper updating/remodeling can be like. Part of the Problem has been were the theater is located. I have a hard time with the people in South Pasadena. They work really hard in stopping things from happening. Examples are stopping a freeway extension, and keeping the the theater from being demolished. Outside of not protesting the construction of the Gold Line. They have protested the running of it. They are not really good at putting a plan togather for Preserving the theater, or doing something about the never ending trafic jam on Fair Oaks. I can see why a theater operator wouldn’t want to spend more money on a site that they didn’t have a future plan for. There is a costly changes coming to the movie business that are very expensive. I will agree that nothing has been done for this theater to be successful. What south pasadena is trying to do is keep their little town as just that. They are attempting to maintain the old fashioned anytown, america, small-town feel for which they are well-known. That is why there is so much filming done in the city when they want it to look like they are in middle america in a town that time forgot. That is precisly the reason why they want to keep the Rialto as just what it is. NO multiplexing is not a good idea beacause when the theatre was built it was designed to be a single screen which means the throw of the projector is perfectly measured. The theatre is very well planned as anyone who has been there can see. All the original elements of the theatre are incredibly resourceful and efficent. The theatre has so many rooms for storage and has everything thought out perfectly. The detail that can be seen both in decorative aspects and functional are inummerable. From a business perspective, Landmark should have put money into the Rialto a long time ago, especially when the new Laemmle opened on E. Colorado. It was that theatre and the competition is created that worked to close the Rialto down more than anything. When the Playhouse 7 first opened in 1999, the Rialto was still selling out shows! That is unheard of and has been for several years. The last movie to consistently sell out the Rialto was Bowling for Columbine. The Rialto ran that film for nearly six months and in its fourth month it was still selling at least half of the downstairs on a weekend, which by the way has a total of 670 seats. Landmark made it impossible for the Rialto to be competitive with the 7 screen Laemmle. In fact, Landmark repeatedly refused money from the city to fix up the facade. There was and still is a long standing offer from a regular patron of the Rialto to paint the entire building FOR FREE with them merely covering the cost of supplies. Landmark of course has refused. I don' buy that it is not financially viable, that is to say that it wasn’t. Had they gotten on the ball and done something about the condition of the building prior to today they might have managed to keep it in better condition. All of that being said I must stress that aside from the cosmetic failings of the Rialto’s front and interior, things work extremely well. I know because I work there and have done for 5 years. It is a beautiful building and it is a shame that it is being closed. There is so much detail that the average patron does not see because of the dim auditorium lights or their inattention. So many people have come in since hearing the news and they say how sorry they are and how sad they are that it is closing. That is very much appreciated by all the staff but really, where have they all been? Many of the people who say what a shame it is that it is closing all relate that it is their first time attending the theatre despite living across the street or down the street. The Rialto is certainly worn but it is no worse for wear. It is not dirty. It may be dusty but it is kept in the best shape that it can be kept in. We work very hard to keep up the theatre as best we can, often doing things that we are not paid for. Several employees past and present have done the frightful task of changing the light bulbs in the gargoyles eyes and it is quite a dangerous task. Changing the marquee and washing walls are some other tasks that are tedious and back-breaking but we did it because we love the place. I’m sorry to all the people who truly do love the place. I hope you will be there on the Rialto’s last night, not to pay Landmark for watching the awful Simpson’s movie, but rather to pay your respects to a theatre who has been around faithfully for over 8 decades. Through thick and thin, rain and shine the Rialto has stood for whomever needed to pass some time. The seats and carpet may be shabby and there might not be modern air-conditioning but that is something that should and can easily be overlooked in favor of experiencing a treasure. When I got this week’s Landmark Film Club email and saw that Landmark had Rialto showtimes listed only through Sunday I knew then it was really going to happen and immediately cancelled my film club subscription even though I won DVDs before. There is nothing indicating the theater is closing and since they had it for so long I was even hoping for one last “Rocky Horror” midnight bash. Landmark’s website is even trumpeting the 75th anniversary of the place and bragging about what a wonderful historic place it is. This was Landmark’s landmark in Los Angeles and it’s going out with a whimper. How sad that all their talk was just that. Brandi’s message above, extremely articulate and full of genuine love for the Rialto, reminds me of the recent closure of the Movieland Wax Museum in Buena Park. So many people bemoaned the closing of the largest wax museum in the U.S. but so many of the moaners were first time visitors during it’s last weeks at $5 a head. If they had turned out before maybe it would be open today. I also must confess that I stopped attending when the quality films stopped and the Hollywood crap began. 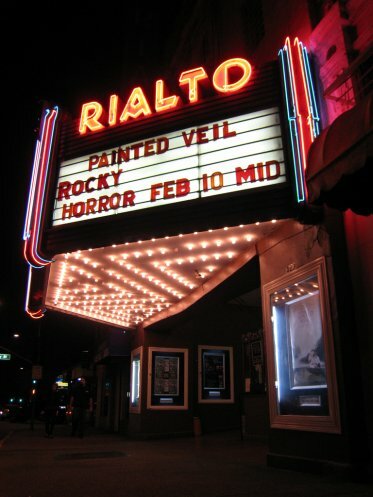 The Rialto ran films that played nowhere else in the San Gabriel Valley and would not have seen “Amelie”, “Gojira”, “A Very Long Engagement” (it was too) and others if the Rialto did not exist. It is a sad commentary that no matter how hard I tried to get my daughter to appreciate classic theaters, after seeing “Amelie” she commented more on the uncomfortable seats and comparably poor sound than she did the film. She loved the Vista and the Dome, however, that do not have these issues. The point is that creature comforts impressed her more than a historic building and I am afraid that applies to most of her generation (she is still a teenager). It may be Saturday or Sunday but I will make one more visit to the Rialto. I can assure you it will not be the screen that has my attention. The sound is still really that horrible nowadays? I thought they had an upgrade a few years back. I really do hope it turns out that this closing is the best thing to happen to the Rialto. Neglect is not a good plan. Two years ago I posted under the Rialto Theater that the building was sporting a sign that said “Theater available for sub-lease”. Apparently there were no takers. PS: The L.A. Times article said the sound system was upgraded last year so I will be able to compare it when I visit today. This was after “Amelie” played. The theatre has never had a sign saying it was available for sub-lease it has said for over a year that it was available for rentals. That is that is is available for screenings, parties, events, etc. The sound was updated when we showed the Lost City, Andy Garcia’s directorial debut last year and it is now very good. Sadly, as of late we have been given mainstream movies to show because they all go to the Laemmle rather than to us. We may have had a chance against the Laemmle but we can’t compete with the AMCs and Edwards Theatres. Sorry, my last post was riddled with typographic errors. I meant to say that the theatre has always been available for rentals but that over a year ago we began advertising that fact on our marquee. I also was attempting to say that our showing mainstream movies was not something that was viable for us because we could not keep up with the mainstream theatres like AMC and Edwards. Instead, we would have been able to continue to compete with the Laemmle by showing arthouse films. Brandi, I wish I had taken a pic but I assure you the sign was there. It was a banner really that was on the actual building above the marquee. I saw it only once while driving down Fair Oaks and it was on the North side of the building if I remember that right. I know you say you have been there 5 years but I know what I saw. I guess it really doesn’t matter now anyway. Zackyyy, how refreshing it is that a young person like yourself can appreciate a classic theater. Well, I attended the first show on the last day and only about 30 people were there. According to the L.A. Times (who took my pic but wisely chose not to hurt circulation by printing it) only 200 came for the last show. While I was there I saw 2 kinds of people: those with cameras and those who didn’t know it was closing. The last show had an attendance of 131. I stayed until the marquee was turned off and lingered in the parking lot with other now ex-employees until early this morning. It was a sad, sad day. It is sad to see this theater close but what was even more sad was seeing it continue to operate in such a depressing state. The Rialto deserves much more than that. Hopefully it will get the attention it needs soon.